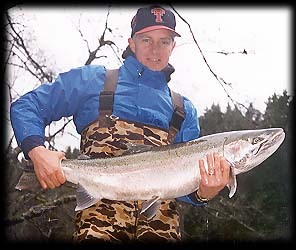 Plugging, backtrolling, running digs, pullin' bills, puttin' out the wigglies - no matter how you refer to plug fishing, there is one thing for sure ... it is one of the most widely used and most effective techniques for salmon and steelhead fishing known to Pacific Northwest anglers. 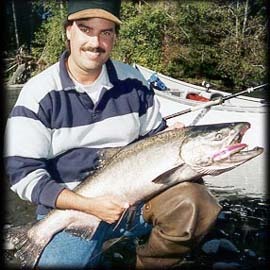 Perhaps the most widely used techniques by fishing guides of the region due to the fact that it gives anglers of all ability levels in the boat an equal opportunity to hook fish, whether salmon or steelhead, as the lure presentation is primarily under the control of the boat operator. Far and away our most preferred method for catching king salmon ... despite their effectiveness, the use of plugs in our fishing for steelhead varies. A backtrolled kwikfish spelled doom for this Olympic Peninsula fall king. Generally, speaking, for inexperienced conventional tackle steelhead anglers, we choose to plug much of the time; although, under certain water conditions, the plugs will never see the light of day and we'll utilize some other techniques that we have found effective. Unless requested otherwise, even with experienced steelhead anglers, we'll usually plug a little bit during the course of the day ... usually in those areas that have proven to be very snaggy or some of the very / fast slow water edges where it can tough to slowly present any other type of lure to the fish. Other times, we'll throw them out as we take a break from casting for a coffee or lunch break. The basics of backtrolling are fairly simple, although the nuances of consistently productive plug fishing are a little more complex than many people realize. The anglers in front of the boat send the plugs out about fifty feet downstream, when fully let out and held against the current, the shape of the plug forces it to dive and wiggle its way to the bottom as the current flows over the body of the plug. After the plugs are 'run out' and working in the river's current, and the rods are placed in rod holders or being otherwise help perfectly still against the gunwale of the boat, the boat is slowly allowed to slip downstream with the plugs at or very near the bottom of the river out in front of the boat, dancin' and wigglin' in the current, enticing sometimes savage territorial strikes from the fish which encounter them. Sizes, shapes, and colors of the plugs very widely based upon the targeted species and water conditions (flow, depth, and clarity). The image to the right shows some of the plugs that we use. A variety of popular salmon and steelhead plugs. 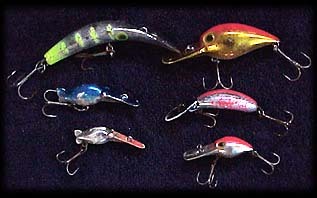 Notice the scarred finishes from frequent encounters with fish, these are proven plugs. The biggest plugs on the top row are some of our salmon plugs ... the banana-shaped plug is a Kwikfish (Flatfish are basically the same, but from another manufacturer), the other is a Magnum Wiggle Wart, an excellent plug for deeper holes. The second row consist of a Hot Shot 30 on the left, a Tadpolly on the right. The bottom row are some our low-water steelhead plugs, a Hot Shot 50 on the left, a Pee Wee Wart on the right. The latter two can only dive effectively on lines of 10lbs. test or less. Although at times, especially for salmon, anchoring in a 'slot' where the fish migrating upstream will run into these plugs can be effectively, we are generally on the move looking for fish. Remember to be courteous to other anglers, while anchoring in one spot with plugs is accepted practice in some holes for salmon, it usually isn't for steelhead, especially on busy days on the river ... know the 'local etiquette' of each piece of water and make your pass through and let the next boat have a turn. Pulling plugs in extremely dirty water allowed this nice steelhead to see and react to our offering. Also remember to not drop in and begin pulling plugs (or any other gear for that matter) below another boat in the same 'hole' (keep in mind, that a 500 yd. flat may have two or three 'holes' in it). If you're unsure of the local etiquette or where the 'holes' are in such a drift, ask the other anglers! A little courtesy goes a long way, and makes the day more enjoyable for everyone! Once the boat is actually moving down through a drift is where the person in control of the boat's skill and knowledge comes into play ... making the difference between a skunk and success! Knowing exactly where to place the plugs, how much side-to-side movement to impart, rate of downstream descent, and how to 'work' the plugs (feathering the oars to create a dig and rise motion, rather than a straight hard wobble), in addition to having chosen the right size, color, and action of plug are all factors in plugging success. Don't expect to go down and just put the plugs out the front end of the boat and catch fish, you'll hook a few, but it takes years of practice and knowledge of the aforementioned factors to become an effective 'plugger'! The savageness of some of the strikes you will receive are one of the most exciting moments in all of fishing. The sudden rush of adrenaline and excitement is indescribable! Some strikes, however, will be much slower to develop, with the plug simply stopping its wobble and then the rod slowly bending over. It is critical on these type of strikes to not the set the hook until the rod is fully bent over, else you will likely come back empty! Resisting the temptation to strike is difficult, especially when it has been awhile since your last bite and you're suddenly surprised by the bite ... one reason that I prefer to use rod holders in my boat. Make sure that the rods are either in a holder or held perfectly still. This allows the plug to work to its maximum depth and keeps it working in very slow water or along current seams ... any rod movement can kill the action of the plug, allowing the plug to lift out the level at which the fish are at ... rendering them almost useless! Make sure that your plugs are properly tuned. A tuned plug wobbles in one place when held in very fast current, if it runs off to one side, you will not achieve the depth that you will likely need and again, will render the plug nearly useless. Instructions for tuning plugs can often be found on their packaging ... if you don't know how, and cannot find instructions, check back, we'll soon be featuring a tip on this very subject! Never run above 12lb. mainline on the standard size steelhead plugs (no more than 10 lb. on the small ones) or above 25lb. on the Flat / Kwikfish (w/o a diver) UNLESS you don't mind sacrificing some depth. Lines heavier than these create too much resistance in the current and the plug won't be able to get down to the bottom where the fish are! Always keep the rods pointed as parallel to the water and straight downstream as possible ... you'll get better action on the plugs and have a better hook-up ratio!